JERUSALEM was formed in the early 70’s and released in 1972 a self-titled album on the infamous Deram label which was produced by Ian Gillan. They gigged all over Europe supporting Black Sabbath, Deep Purple, Uriah Heep and Status Quo before disbanding due to “musical differences”. The band reformed again in 2008 releasing their second album “Escalator” to much acclaim. Now for their third album with original members LYNDEN WILLIAMS and BOB COOKE they are joined by the cream of the Prog Rock crop GEOFF DOWNES (ASIA,YES) and NICK D’VIRGILIO (TEARS FOR FEARS, SPOCKS BEARD) and they have produced a stunning brand new Prog Rock album. What a band! What an album!! 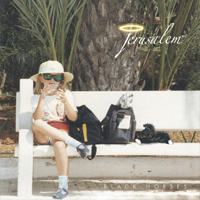 'Black Horses' is an album not to be missed! Even those who are not prog-rock disciples should give this a listen and enter Jerusalem with an open mind. Black Horses is indeed a very fine release, and even if you've never heard their heavy rocking 1972 debut, chances are if you like modern prog and '70s styled hard rock you'll get a lot of mileage out of this one.